All my adult life I have worn a corset. It began when my mother lamented the development of my ‘puppy fat’ as a teenager. Words such as ‘inelegant’ and ‘unsightly’ were bandied about, and pretty soon I found myself bound into what was to become my second skin. I didn’t mind, really. It meant that I pleased my mother by looking, if not beautiful, acceptably nice to present to her friends. I was her daughter, and that was all that mattered. It was the same with God. My corset meant that I could stand tall and straight before him, strong in my faith. If there was any bowing or bending to be done in humility or adoration…..well, he knew my heart anyway. With God, much like my mother, I knew I was presentable, because all that unsightly fat was tucked away out of sight and my posture was correct. However, there seemed to be something missing, something I couldn’t quite put my finger on. And as with so many other irritations, without my realising it, my discomfort was projected outward onto someone else. That someone else turned out to be a woman at my church. couldn’t she lose a bit of weight, or, like me, wear something more flattering? But what really annoyed me was her cheerfulness. How could she not be distressed and ashamed at her appearance? Instead she seemed to be blithely ignorant of her condition. It took me some time to understand that I was jealous of her freedom from any self-recrimination in the face of what I saw to be an unsightly impediment. (Unsightly – there’s that word again, straight out of my mother’s mouth). I knew I had to get to the bottom of it all, so eventually I swallowed my acrimony and approached her after a service, coffee cup in hand. I was caught off guard, but then thought, ‘Well of course I do. I take care with my appearance.’ And then, to my shame, ‘Not like you.’ I then resolved to be as nice as I fancied my looks to be. “Thank you. I like it. It’s nice to find something that fits and looks good. I don’t know about you, but I’ve found it impossible to lose weight. I gave up a long time ago. Now I just ‘let it all hang out’ so to speak.” And she laughed. Let it all hang out!!? I felt the earth move beneath my feet as mother revolved in her grave. Cuddly!!? Mother did another 360 degree turn. 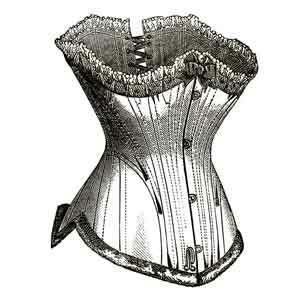 that it was her corset, the same sort of corset I wore. I went home that day with my head full of questions and challenges. It seemed that something had to be done, and that something had to be shedding my second skin, my corset. The morning I finally had the courage to do that, I nervously came into the kitchen where my husband was reading the paper over breakfast. He put down his paper, looked me up and down and said, “You look different. I can’t quite put my finger on it, but you look……lovely.” Then he got up, came over to me and hugged me. I ignored my mother’s frantic protestations, and simply basked in my husband’s approval. My newfound freedom felt delicious. Then I thought of my grandmother, and wondered if it could be the same with God. Well, there was only one way to find out…….